Labyrinth designs are found on pottery, tablets, and tiles that date as far back as 4000 years. There are many different labyrinth designs, but most of them share in common a circular pattern with one path. The one path takes you to the center and the same path brings you back out again. The labyrinth design was woven into the baskets of the Hopi Indians of the American Southwest. 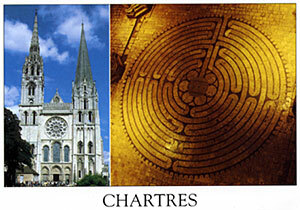 The most famous labyrinth still existing in a cathedral in Europe is the Chartres Cathedral labyrinth, in Chartres, France. Often people will confuse labyrinths with mazes; a maze has several dead ends and is confusing. In a labyrinth there is only one path, that one path takes you to the center and that same path leads you back out again. Labyrinths are currently being used worldwide as a way to quiet the mind, find balance, and encourage meditation, insight and celebration. They are open to all people as a non-denominational, cross-cultural tool of well being. They can be found in medical centers, parks, churches, schools, prisons, memorial parks and retreat centers as well a peoples backyards. Printed materials are provided upon request, telling the story of labyrinths in many different cultures throughout history. The labyrinth has been used in many different faiths. In the Christian faith, labyrinths have been used for centuries as a spiritual tool for prayer and meditation. No culture or faith community can completely claim the labyrinth because they are found all over the world.